SPANISH FORT - ALABAMA - Retired U.S. Army Colonel Roy Clayton Brewer, 89, died Sunday, September 3, 2000, at a local health care facility. He was a native of Bigbee, Alabama, and a resident of Spanish Fort. 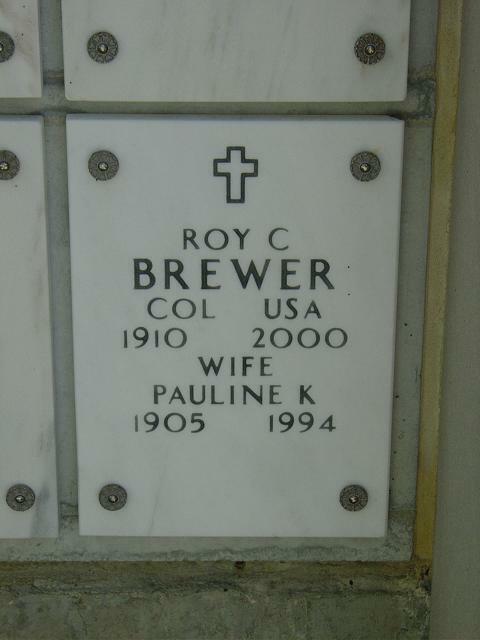 Brewer was an Army veteran of World War II. He was awarded the Silver Star Medal and the Award of Oak Leaf Cluster for his wartime military service. He is survived by his nephew, Richard A. Medley of Montgomery, and other nieces and nephews. Burial will be in Arlington National Cemetery in Arlington, Virginia, at a later date.